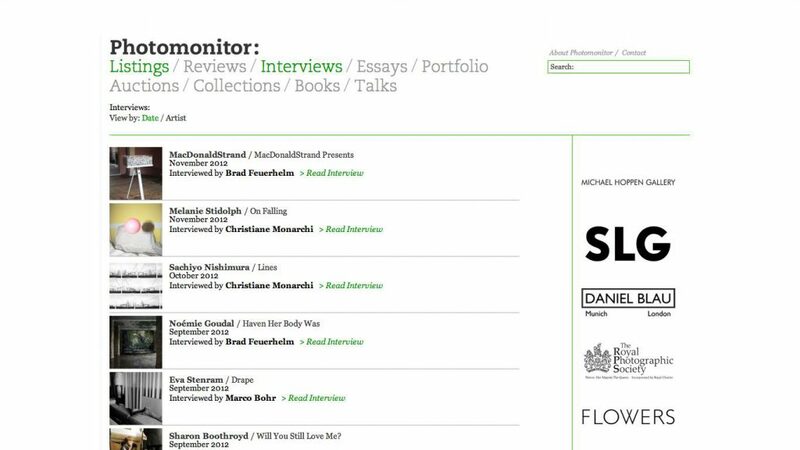 Online now, interview with Christiane Monarchi, Editor of Photomonitor for its November issue. Discussion around the new work for exhibition The Fall centering on the possibility of shifts in tone in the work from ‘playful ephemeral whimsy…. (to) possible darker meanings – the possibility of mishap, accident, or even violence’. The full interview can be found at www.photomonitor.co.uk. 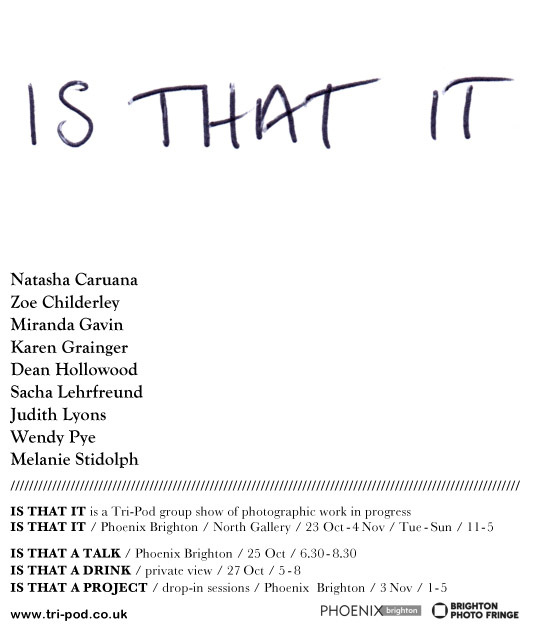 Is That It is a group exhibition by the Tri-pod group of photographers. Tri-pod was established by Miranda Gavin and Wendy Pye as a platform for encouraging and demystifying the creative process. This group exhibition was conceived as a stopping point for work in progress; each of the 9 participating photographers are showing work that in some way is not yet fixed in its presentation method, image selection, or ongoing development of ideas. The exhibition is part of the Brighton Photo Fringe and is on until Sunday 4th November showing work by: Natasha Caruana, Zoe Childerley, Miranda Gavin, Karen Grainger, Dean Hollowood, Sacha Lehrfreund, Judith Lyons, Wendy Pye and Melanie Stidolph. A big thank you to everyone for all their work in putting it together. 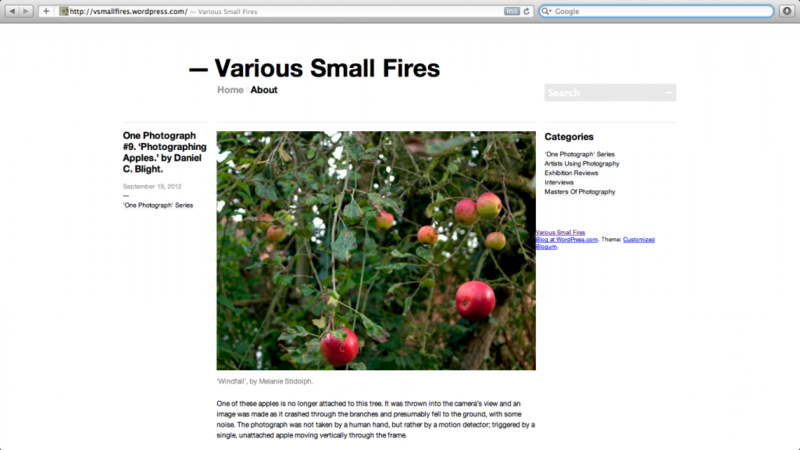 Thanks very much to Daniel C Blight who chose my work Windfall as the starting point for his intriguing piece of writing for the site Various Small Fires. Daniel was invited by Thierry Bal to contribute to the One Photograph series. 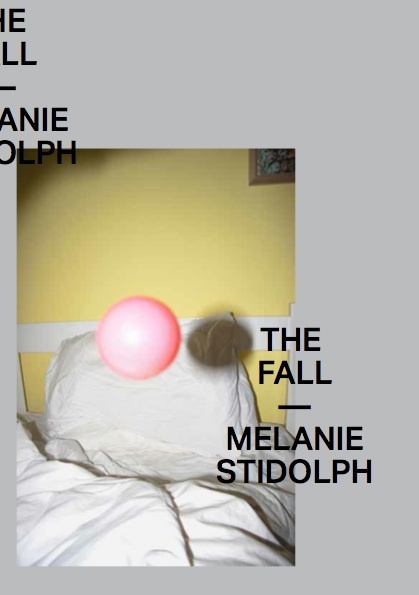 Daniel’s writing will also appear in a new publication as part of my upcoming solo show The Fall at Campbell Works (October 11th – November 4th) where Daniel will be talking about his writing at the gallery on Saturday November 3rd at 3pm. 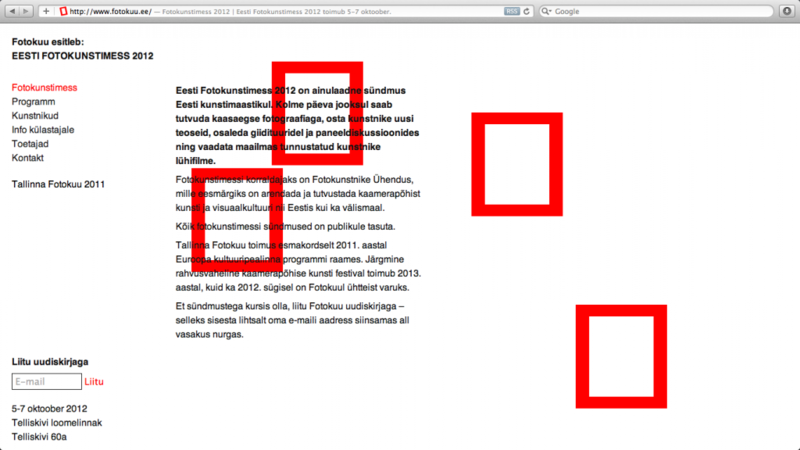 Big thank you to Kristel Raesaar and the Union of Photogaphy Artists in Estonia for their recent invitation to visit. The group who organised last year's Tallinn Photomonth and this year's upcoming Contemporary Photography Art Fair are doing some great things and creating a strong photo scene in the area. Met some amazing photographers, artists and gallerists and saw some incredible work. Find out more about them at – www.fotokuu.ee, there's also a review of last year's Photomonth here – 1000wordsphotographymagazine.blogspot.co.uk, sign up to their website for news of next year's Photomonth. Its only an easyjet flight away. 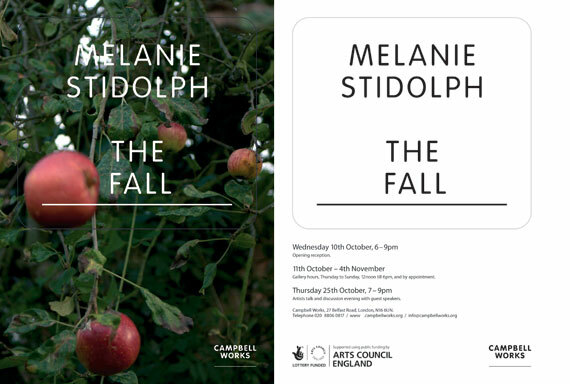 The Fall, solo exhibition with Campbell Works later this year. 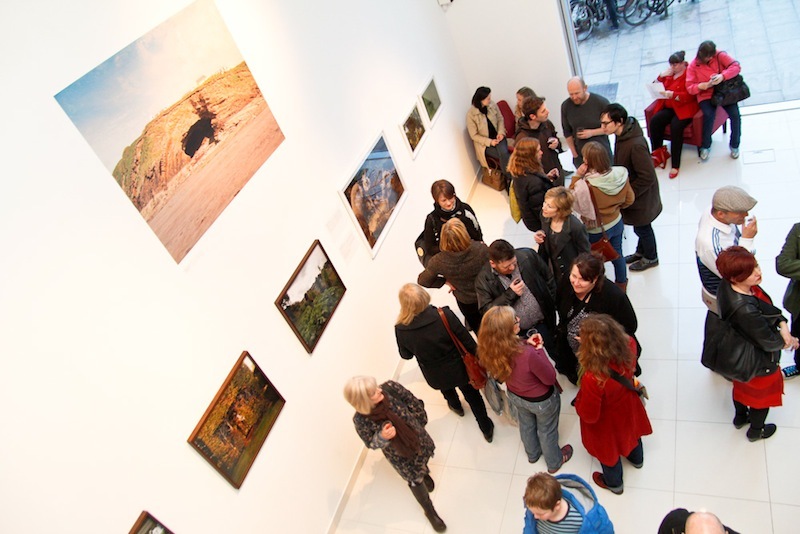 Exhibition and new work supported by Arts Council England. Accompanied by a new publication, which will include an essay by Daniel Campbell Blight. New works based on ideas developing from the work Windfall. Looking at the hope, tension and sense of impending disaster in images of objects and subjects in temporary flight. Currently experimenting with movement, light and sound sensors, enabling subjects and environmental conditions to trigger the shutter. www.campbellworks.org. Last year I was commissioned to produce a portrait as part of The World in London project, organised by The Photographers’ Gallery. The launch was on Wednesday morning at Victoria Park, where the large scale portraits are displayed on hoardings. 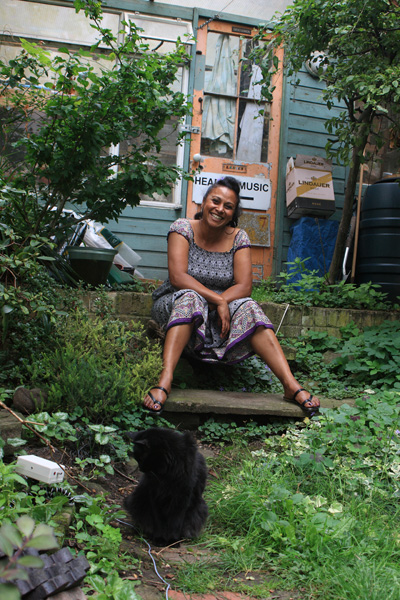 They are also on the outside of Park House on Oxford Street, opposite Selfridges, and selected images, including mine (triggered by a Siamese-cross cat called Dot) of Mauritius born Corina Armel are also at the Gulbenkian Foundation on Hoxton Square. All the prints will become part of The Museum of London collection. 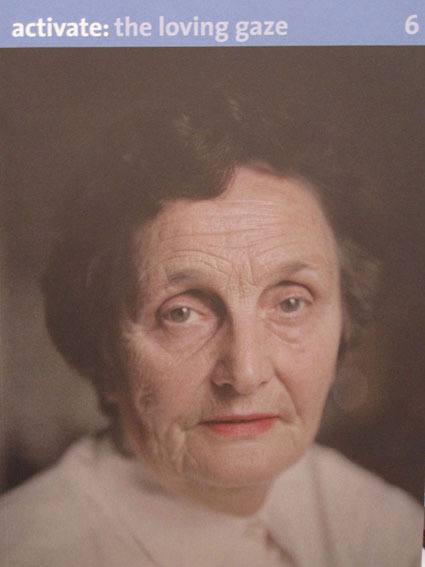 See the project website at www.theworldinlondon.org.uk, to view images, find venues and hear the sitter’s stories. In 2010 I was invited to participate in The Loving Gaze symposium programmed by Susan Andrews and Fiona Yaron-Field, from London Metropolitan University. I presented Heather McDonough’s recent work on her mother’s terminal illness, and Heather presented my work under the title My Boyfriend and Other Animals – ‘Melanie’s images seem to arrest or suspend time, to highlight a notion, smell or sound.’ activate is edited by Susan and Fiona and focuses on a different issue each publication. Two exhibition openings this week, Collectible at ZAP Project space, with over 60 artists, and Photo-Soup at Unit 24. More info at www.zeitgeistartsprojects.com and www.photo-soup.org. I seem to have a rabbit theme going on, showing small versions of The Hare, Skomer and large print of The Hole.